Robert E. Lighthizer was sworn in as the 18th United States Trade Representative (USTR) on May 15, 2017. An experienced trade negotiator and litigator, Ambassador Lighthizer brings a history of tough U.S. trade enforcement and a record of standing up for American workers, farmers, manufacturers, and businesses. 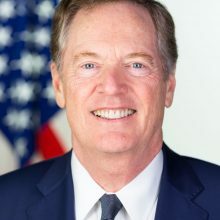 At the time he was chosen by President Trump to serve as USTR, Ambassador Lighthizer was a partner at the law firm Skadden, Arps, Slate, Meagher & Flom LLP (Skadden), where he practiced international trade law for over 30 years. His work there on behalf of American workers and businesses in the heavy manufacturing, agricultural, high-tech, and financial services industries opened markets to U.S. exports and defended U.S. industries from unfair trade practices. He was lead counsel for scores of trade enforcement cases and was a well-known advocate for the type of “America First” trade policies supported by President Trump. Before joining Skadden, Ambassador Lighthizer served as Deputy USTR for President Ronald Reagan. During his tenure, Ambassador Lighthizer negotiated over two dozen bilateral international agreements, including agreements on steel, automobiles, and agricultural products. As Deputy USTR, he also served as Vice Chairman of the Board of the Overseas Private Investment Corporation. Prior to becoming Deputy USTR, Ambassador Lighthizer was Chief of Staff of the United States Senate Committee on Finance for Chairman Bob Dole. In this position, he was a key player in enacting the Economic Recovery Tax Act of 1981, which was the most significant tax reform in decades, as well as the other basic elements of the Reagan economic program. Ambassador Lighthizer earned a Bachelor’s degree at Georgetown University and his Juris Doctor from Georgetown University Law Center. He is a native of Ashtabula, Ohio and has two children.